is positioned between UAP-AC-PRO and UAP-HD. is only for indoor use with 1 single LAN port. seamlessly into any wall or ceiling surface (mounting kits included). The UniFi®AP-LR offers a longer range – up to 183 m – than the base model UniFi AP or UniFi AP-PRO. 2×2 MIMO for the 5 GHz band and up to 450 Mbps, 3×3 MIMO for the 2.4 GHz band. The UniFi®Controller software is a powerful, enterprise wireless software engine ideal for high-density client deployments requiring low latency and high uptime performance. A single UniFi Controller running in the cloud can manage multiple sites: multiple, distributed deployments and multi-tenancy for managed service providers. In some cases, users may encounter issues with certain client devices being unable to connect to Wi-Fi or have specific performance issues that appear to only coincide with certain segments of devices. For example: Android phones cannot connect to my UniFi network or iOS devices frequently disconnect on my network. These can be confusing and difficult issues to solve for network administrators especially since in many cases the root issue can be difficult to identify. To most quickly identify and resolve these issues, users need to identify the common threads/scope of the issue and use that to narrow down to a root cause. This article will explain how to approach issues like these and list some common causes. When a client device connects or fails to connect to a UniFi network, the process on the UniFi side is relatively simple and straightforward. This doesn’t change for each individual type and variety of client. UniFi has millions of APs in deployment that work with all manner of client devices without issue. Additionally, UniFi does performance tests on hardware with a variety of client devices to ensure proper function. Outside of UniFi, there are many variables involved with all the different devices, network drivers, wireless adapters, etc. that often go unnoticed/aren’t frequently considered. In most cases, issues assumed to be UniFi issues that are confined to a segment of client devices end up to be totally unrelated to UniFi. In some cases, you can change your UniFi configuration to help adapt your network to the limitations of your devices. For instance, fast roaming may not work well with all client devices depending on how old they are, how these products roam by default, etc. What do these devices have in common? Location? Device hardware? OS version? When did the issue start occurring? Does it occur in all cases or is it intermittent? Is the issue consistently reproducible? Many users mistakenly attribute any issue they encounter on a Wi-Fi network to the hardware connecting the devices or the internet service provider, using proper troubleshooting and not assuming a particular explanation will help you resolve issues as quickly as possible. Verify user-reported issues yourself- most often the cause for individual client Wi-Fi issues that are unreproducible by others is user error with WPA key entry or similar issues. Make sure client has high signal strength and eliminate interference from the equation if at all possible. Reboot client devices first when a small number of individual client devices are affected. Try updating wireless adapter drivers on client devices when a subset of devices with same wireless adapter are malfunctioning, or in individual cases. Once you’ve arrived at an understanding of what the behavior is and confirmed it, perform a web search for similar error messages/behaviors from similar client devices- if the device affects all Android devices for instance, you’ll certainly find mention of in threads unrelated to UniFi. Follow steps and contact the device vendor for help. In individual cases where an issue proves difficult to resolve, scan the device for any malware that could be causing connectivity issues. Try eliminating any advanced features like RADIUS or fast roaming from your UniFi Configuration to ensure that they haven’t been improperly configured or that your devices do not support such configurations. Set up a parallel, simplified Wi-Fi network with as few modifications to default config as possible to see if issue is eliminated. Use packet captures to monitor traffic to help identify root causes. Search on community.ubnt.com for similar issues or post asking for suggestions. When issues affect all devices, this implies that the issue is more likely to be a result of poor configuration or a potential performance issue on the UniFi side. If you encounter issues that are reproducible across all subsets of devices and appear to be related to UniFi and its function, please post on our community or contact UniFi support for additional help. It’s hard for users to know what speeds they need and should expect. UniFi’s products are designed and tested to ensure they can provide for this typical use for many clients simultaneously. Any Access Point (AP) currently being offered in the UniFi product line offers far greater potential throughput than any client application could realistically require. Ubiquiti’s Firmware updates often include performance improvements: make sure that before testing performance, you update your UniFi Controller and UniFi Devices to the most current firmware available. It is recommended that a full site survey be performed for high density/high priority Wi-Fi deployments. 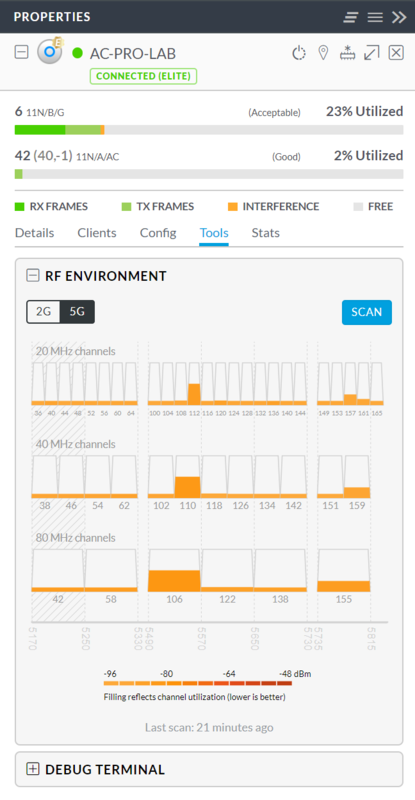 If that has not been done or the site doesn’t warrant it, the UniFi Controller can help you find a better channel assignment for your APs by performing an RF scan. To increase TX power on 5GHz, go to device configuration > Radios > Radio 5G (11N/A/AC), and only select “High” from the dropbox under Transmit Power. Summary: When testing throughput make sure to consider the signal strength between the device and AP, you can find this under the Clients tab in the UniFi Controller. If range on 5GHz is very low, consider increasing Transmit Power on the AP’s 5GHz radio. While UniFi does include a speedtest, the results are often far lower than reality, especially since UniFi’s available speedtest servers are limited and results are very sensitive to proximity of the speedtest server. Try using a popular speedtest app or website to test to check your UniFi results. Be sure to test multiple times and do not rely on assumptions or past data to inform your comparison. If you wish to most accurately assess Wi-Fi speed alone and rule out other factors, try performing an iPerf test between a wired and wireless client/between two wireless clients. iPerf only measures bandwidth between two devices on your network. Note that iPerf can still be limited by the syntax you can use, number of streams, packet size, etc. so make sure you understand what you’re doing before using iPerf. When benchmarking Wi-Fi, it’s important to also compare across devices to ensure that the client itself isn’t limiting performance. Factors like client CPU utilization, network card driver, Wi-Fi specs, software, all can influence speed test results. Make sure to test with multiple devices. To truly measure peak throughput you must test a device that matches the capabilities of the UniFi AP. For instance, if you are testing with a device check the manufacturer specifications to see how many streams the 5GHz antenna supports i.e. Apple iPhone 7 is 2×2, UAP-AC-PRO has 3×3 5GHz radio, thus this iPhone will limit peak throughput. If a performance issue with Wi-Fi is isolated to one device, or multiple devices running the same software version, this will almost always point to a problem with the device/software. UniFi doesn’t change how it functions for each variety of client device. Try performing a web search to find other users experiencing similar issues with the same device on other vendor products. Keep in mind that declined performance on a single device isn’t a sign of a malfunctioning AP. UniFi APs are backwards compatible with older client devices and the fact that devices are able to connect with their older hardware is a sign the AP is working as designed. The most common intermittent connectivity symptom is a laptop or mobile phone showing full WiFi signal, but when using network services/browsers, no sites or pages load. Browsers will sometimes report no Internet connectivity, but will also sometimes spin forever loading pages. Sometimes an exclamation point will appear with the WiFi bars, and sometimes the client device will select an auto-assigned IP (such as 169.254.x.x) for its IP address on the LAN. Many of these types of issues have been fixed in recent UAP firmware releases, so please ensure that you are using the latest firmware release for your devices before investigating further. See this article for how to update device firmware. This article offers suggestions for debugging and fixing these types of issues for a smooth Internet/network experience. First and foremost, it is important to determine whether the problem lies in either the wired or the wireless infrastructure of the network. Try to continuously ping Google’s public DNS (8.8.8.8) and your router simultaneously from two terminals on a laptop. If there is packet loss to both IPs, then you likely have a wireless issue. If there is only packet loss on 8.8.8.8, then you likely have a wired/Internet issue. This article focuses on resolving wireless issues only, not wired issues. Please note that many laptops enable WiFi power-saving mode on their WiFi interface, regardless of whether the laptop is charging or not, and you may see ping responses up to 1.25 seconds late, especially if the laptop is not busy doing anything else on the network. This is designed by laptop manufacturers to conserve power, and this article will focus particularly on resolving packet loss , not packet latency. The following AP network configuration, as seen on the access point’s properties panel has three errors. Can you spot them? The subnet mask is too narrow to provide a route to the gateway. The Gateway itself is not on the same subnet as the static IP address. There is no Preferred DNS configured. Misconfiguration can lead to inability to upgrade UAPs, NTP sync failure, among many other intermittent issues that are difficult to diagnose. For the best experience, it is important to ensure that all UAPs have full citizenship on the network, including DNS access and Internet-routability. Try moving closer to the UAP that your client is associated to, to verify if the problem goes away. If the problem is resolved, then you may need to re-assess the locations and count of your UAP deployment. 2. Then copy the resulting pcap file to your laptop for viewing in Wireshark. This copies the capture.pcap to /tmp on your computer. You can also use winscp similarly. 3. Now open the file in Wireshark. If there is a network loop somewhere, you will see a large amount of multicast or broadcast traffic in the capture file. Typical networks will have less than 100 kbps of multicast/broadcast traffic, totaling only dozens of packets per second. If there are thousands of multicast/broadcast packets per second, then you likely have a network loop somewhere that needs to be resolved. Keep disconnecting infrastructure devices until the number of multicast/broadcast packets goes down to a reasonable number. High TX power also causes an imbalance in the WiFi link budget between the mobile client and the UAP, because most mobile clients have a TX power between 14 and 18 dBm. Mobile clients will stay connected (and show full WiFi bars) to an AP with a strong signal from the AP to the mobile client, even if the signal from the mobile client to the AP is not sufficiently strong. Some features such as band-steering, minimum RSSI, and connection monitor can cause adverse effects if misconfigured or implemented with an insufficient number of APs. It is good to disable all of these features when debugging connectivity problems so that base functionality can be verified without any extra variables. The AirTime-Fairness feature can also be disabled to bring base functionality to the bare minimum. Some older/misconfigured routers and DHCP servers transmit the DHCP offer/ack messages as broadcast packets, which are much more likely to be dropped. This can lead to slow connection times and intermittent connectivity. Please ensure that your DHCP offers and ack messages are unicast packets, not broadcast (the discover packet from the client can still be broadcast). A default DTIM period of 1 is used for compatibility and legacy reasons. However, many modern devices including recent iOS and Android phones, will perform better and save up to 66% of their WiFi battery consumption if the period is set to 3. For networks with nearly all modern devices, it is recommended to use a DTIM period of 3 instead. Wireshark can be downloaded for most platforms at www.wireshark.org. Modern (2013+) MacBooks are recommended as they 1) have full driver-support for monitor mode, and 2) have premium 3×3 radios that are capable of hearing 3 NSS traffic (up to 1300 Mbps physical rate). Linux can also be used with some laptops, but most laptops only have 2×2 radios, so they are less useful. Click on the gear icon at the top. Click Close, and restart Wireshark. Start a capture on en0. You should see beacon, control, and management frames interspersed with data frames. NOTE: At the time of writing this article, there was a bug in Wireshark where capturing in monitor mode would fail the first time it was enabled, unless Wireshark was completely restarted first. 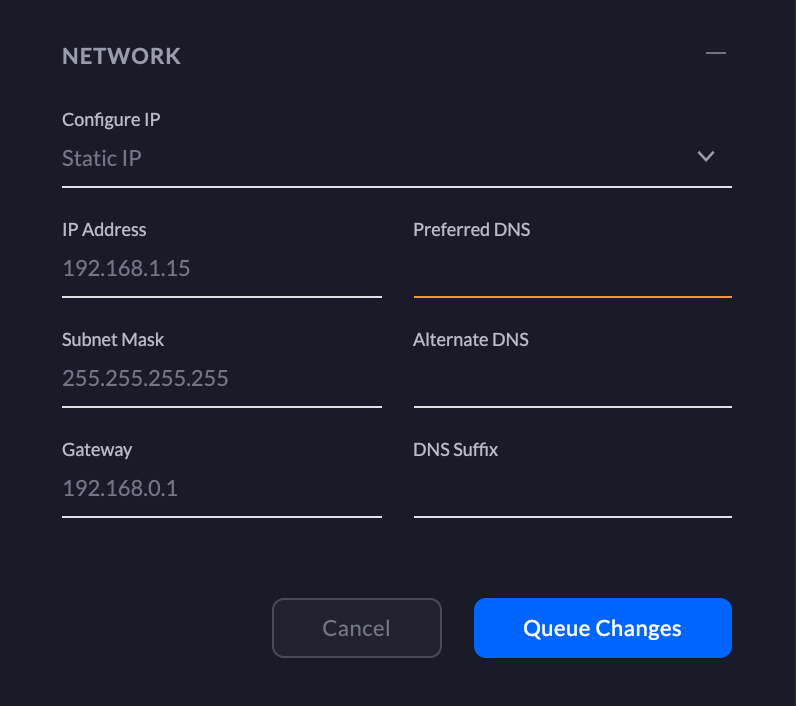 You can upload this capture to the community or to UBNT support, and be sure include the MAC address of the laptop or mobile device that is having issues. In the above example, you can see that ath6 is the VAP for the ubnt-ut-AP-LR network on the 5 GHz radio. 6. Try the ping again, and see if the 00:00:00:00:00:01 unicast packets arrive at the athX interface on the UAP. After you’ve determined whether there is packet loss from your client to the UAP, now it is time to determine if there is packet loss from the UAP to your client. 1. First, you will need to start Wireshark or tcpdump on your laptop to validate whether packets are getting to your laptop. 4. At the time of writing, UAPs do not have a way to set a static ARP entry, so if unicast traffic can’t be produced from the UAP, you can try producing the packets by setting a static ARP entry on a wired desktop/laptop, then sending the packets from that separate device. You can give the capture results to the community and/or a UBNT employee to help diagnose where packet loss is occurring. Check the uptime of the APs to make sure they aren’t rebooting. Uptime can be checked by clicking on the UAP in the Devices section and seeing the Details > Overview section of the Properties Panel. Or in the Uptime column if the Devices section is in list view. If the uptime keeps getting reset, and coincides with network downtime, then you may have uncovered a bug, and we’d love to know how we can reproduce the problem in our labs. Let us know via our Community. There is always a small chance that hardware could have been damaged as there are many hands that your UAP has passed through from our factory to your desk. For cases where major packet loss cannot be resolved, regardless of what firmware you try, please continue reading. It is best to set your 2GHz and 5GHz radios up on separate SSIDs, and even better to set both of them to different SSIDs from all other UAPs, for testing purposes. For example, if your network name is “HomeNetwork”, set the 2GHz SSID to “HomeNetwork-test2” and 5GHz SSID to “HomeNetwork-test5” so that they don’t conflict with each other or any other SSID. If you have more than one SSID per radio, you only need to test one SSID per radio, so you only need to modify one of the SSIDs per band, not all of them. This will give you the number of chains available on radio 0. This is a mask, so 3 means you have 2 chains, 5 means you have 2 chains, 7 means you have 3 chains, 15 means 4 chains, etc. 4. Use “WiFi Analyzer” or some other app to view the signal strength of the UAP’s beacons on chain 0 for both 2 GHz and 5 GHz. You should be standing within 10 feet of the UAP, and if the signal strength is lower than -60 dBm, you may have an issue with that chain. 9. Then run in the opposite direction. 10. Broken hardware will typically get far less throughput in one direction than the other (i.e. 50 Mbit one direction, and 0 the other). If this is the case, please @mention a UBNT employee in a forum topic for confirmation and next steps. If the UAP has been adopted by the UniFi Controller, it can be reset from the controller. Do so by “Forgetting” the device. NOTE: The location of the reset button might vary on different UAP models, find your device’s in the Quick Start Guide. You can download the current Quick Start Guide in https://www.ubnt.com/download/unifi/ using the left hand menu to find the correct product and scrolling down to the Documentation section. 2.4GHz Band Over-utilized: In cases where an AP is seen to have too many clients on 2.4GHz, an administrator may opt to enable Band Steering on the AP. Band steering requires Advanced Settings to be enabled under Settings > Site. Once Advanced Settings are enabled in the UniFi Controller, band steering can be enabled by clicking on the AP with the high number of clients, opening the Properties Panel. Go to Config > Band Steering, and select “Prefer 5G”. Save and apply changes and then monitor the AP to see whether performance improves. More clients should now be seen on 5G.